Some of my favorite uses for leftover turkey are a neat riff on magiritsa soup and cheesy enchildadas. But what I really look forward to, the holy grail of leftovers, is the Black Friday Turkey Sandwich (BFTS). I know it's just a sandwich and technically I could have a turkey sandwhich any day of the week, but only after Thanksgiving can I have that sandwich piled with turkey, layered with tons of crisp lettuce and slathered with cranberry sauce on some thick, awesome bread. Normally I buy a nice hearty Italian bread for my BFTSs but a little bit of fate intervened this year. Regular readers know that I'm cooking along with Alana Chernila's The Homemade Pantry: 101 Foods You Can Stop Buying and Start Making as part of the From Scratch Club's virtual book club. Our latest assignment involved breads and crackers, so this weekend I made what Alana calls hamburger buns. 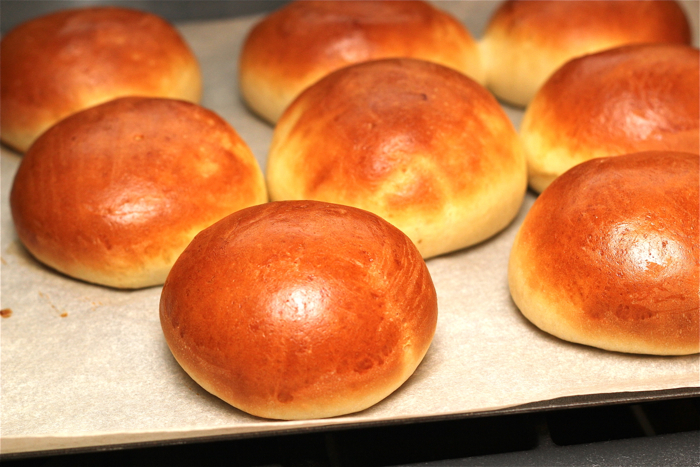 These buns are not only delicious but gorgeous and huge -- just the ticket for the BFTS! ... but it's worth the mess when you see the result. The buns have a slightly eggy flavor that I think will complement the turkey-dinner-on-a-bun lineup quite nicely. And their size is perfect: the recipe calls for making eight buns from the dough, which results in enormous buns (if I make them again for hamburgers, I'll likely make 10 buns instead). All the better for packing in the leftovers. In a small bowl, whisk together the water, milk, yeast and sugar and let stand until slightly foamy (5 minutes). In a large bowl, mix the flour and salt. Add the butter pieces and, using your hands, squeeze and rub the butter into the flour. Add the yeast mixture and eggs and stir until dough starts to form. Put the dough on a floured work surface and knead it hard for 10 minutes (you can add more flour as the dough gets sticky). 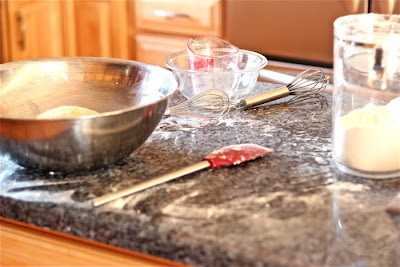 Shape the dough into a ball and put it back into the large bowl. Cover the bowl with plastic wrap and let it sit in a warm place (70 degrees worked for me), rising until it has doubled in size (2 hours). Cut the dough into 8 equal pieces (for hamburgers, you might want to make that 10 pieces). Shape each piece into a ball and place the balls a few inches apart (they will get bigger) on a baking sheet lined with parchment paper. Cover the sheet loosely with a dish towel and let the buns rise (again, in a warm location) for another hour or two. Put a metal (not glass, it could break) full of water on the floor or bottom rack of your oven and preheat it to 400 degrees. Make the egg wash and brush the tops and sides of the buns. Place the baking sheet in the oven and bake about 15 minutes or until the buns are nicely browned, turning the sheet halfway through. Cool on a wire rack. 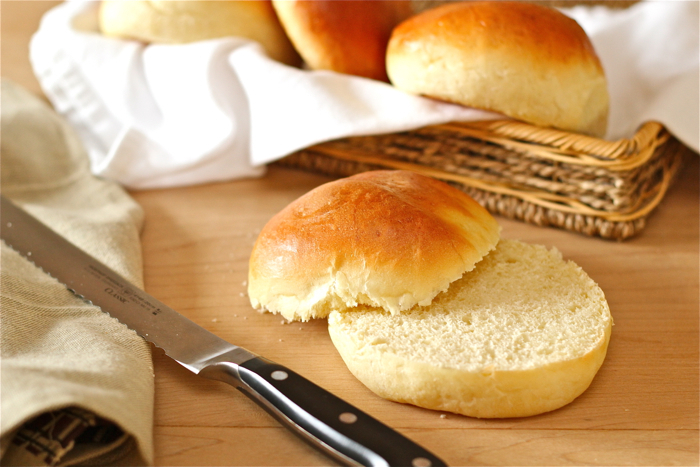 Those are some beautiful buns, perfect for that turkey sandwich! Thanks, Pam -- I'm not an experienced bread baker, so I was pretty happy with them. how long will these buns keep stored? can i put them in freezer for long term storage? You can store them in a ziplock bag for a few days with no issues. And I froze a whole bunch of them and have since defrosted and eaten them: worked like a charm, so go ahead and make enough to freeze.